Vergs and I moved to Oahu in October but we only really started doing touristy things in December — after we were officially done with hotel life and once our house was feeling more like a home. 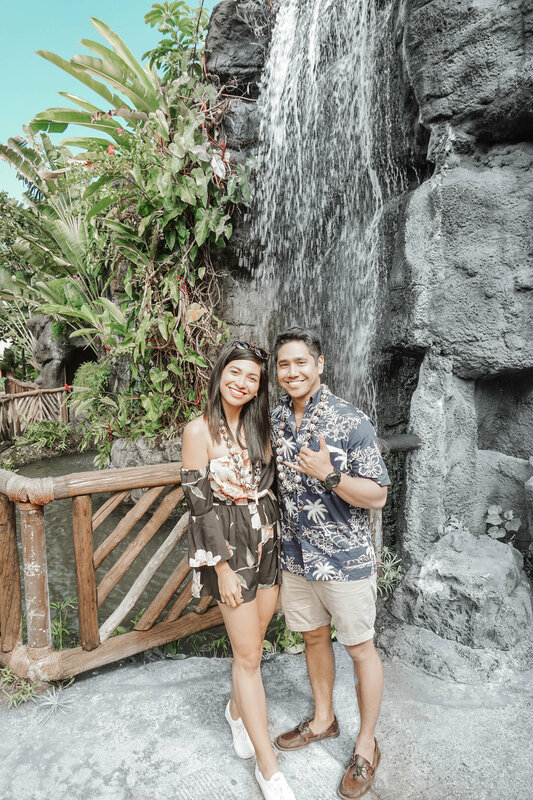 We figured we deserved a little time off from adult life, so we booked a full day at the Polynesian Cultural Center, not knowing what to expect at all. I did a little IGTV of our first visit to PCC, so if you want to watch that, just click here. PCC has many different packages that you can choose from. But if you’re affiliated with the military, I suggest you buy your tickets at the base’s ITT. Every dollar counts when in the expensive paradise of Hawaii, so when life gives you an opportunity to save, you take it and give a little nod to your bank account. We got the Ambassador Luau Package that came with a guided group tour, a luau dinner, and reserved seating for the Ha: Breath Of Life show. If you’re not keen on a tour, you can opt for the admission and show package instead. It still includes a luau dinner anyway, so you won’t miss out on much. It’s important to know that your ticket will give you access to PCC for the next 3 days after your initial visit. This is awesome because PCC is huge. One day alone wouldn’t be enough to go around all of the villages and watch the shows. We personally went back after our first round, just so we could go to 3 other villages we missed the first time. Btw the Hukilau Marketplace is open to everyone. So you can still go, eat at the restaurants, and shop at the little stores even after your admission has finished. I say get all dressed up for it and wear anything floral you have in your closet. Hawaiian shirts would work for the men too! Also, wear comfortable shoes. You’ll most likely be on your feet the whole day, so wear something you know you won’t be limping around in. It does tend to get chilly at night, so bring a little cardigan if you’re watching the Ha: Breath of Life show in the evening. Okay, now that I think I’ve covered all the basics, let’s get on the main purpose of this blogpost. You know how everybody says the word, “ukulele” as “yoo-ka-lei-lee”? In Hawaii, they say “ooh-koo-leh-leh”, which translates to jumping fleas. My IGTV shows a few scenes from the Haka performance, so you can go have a look with this link. To be honest, the Haka is still one of the most powerful things I have ever seen. I don’t really know how else to describe it really. It’s just something that draws you in. And the thing is, you don’t even have to understand what it is they’re saying or doing — it’s just such a commanding performance. We were lucky because we were able to learn and play all of the games in the Aeoteoroa village. My fave one definitely has to be the stick game, just because it involves a lot of hand and eye coordination. The poi dancing would’ve been fun if I actually got the hang of it. Hahah! The canoe show is PCC’s main attraction. It’s where all the villages stop their own shows and programs, to prepare for a show on the river. I don’t want to say too much because I don’t want to give anything away. But what I will say is that it’s important to get a good seat. The canoe show starts at 2:30pm, but our tour guide told us to find seats by 1:30pm because the crowd would be insane. He was right. I know, this is such a touristy thing, but oh my gosh you guys, this drink was so good, we had to have it on all the days that we were at PCC. The one we got was a virgin pina colada drink, which was so sweet and tasty! I honestly think I’m making it a habit to get it every time we bring family and friends over to PCC. The Samoan show is one of the most entertaining ones at the PCC. The one we saw had Kap Tafiti, the Samoa village’s senior ambassador, running the show, and he kept everybody entertained no matter what country they were from. Also, you can do other activities at the Samoa village including making a fire and learning how to twirl a fire stick. Heads up, they’re both harder than you think. Not gonna lie, you guys, I was so mesmerized with how the dancers were shaking their hips. And I mean mesmerized like borderline-staring-like-a-creepy-guy because it truly is just so mind-boggling. I mean, how can hips move that fast?! Anyway, if you do want to give it a try of your own, the Tahiti village will show you a thing or two about the basic moves. And from then on, you just have to pick up the pace and move your hips like crazy. Want to try rowing, but don’t want to wait in line? Go to the small canoe area at around 5pm or right before you head to your luau dinner. Don’t feel like exercising when on vacation? Go on the bigger canoe ride. They’ll do the rowing for you. The luau is pretty intense in the sense that there are a ton of food options to fill your plate with. I’m all for trying different types of food, so I say get a little bit of everything. Just remember to save some room for the kahlua pig that everyone seems to be crazy about. They’ll lift it up from the sand and cut it up into little pieces that you can bring to your table. If you’re familiar with what the Filipinos call their lechon, then think of the kahlua pig as the Hawaiian’s version of it. After going around PCC the entire day and stuffing our bellies silly with the food at the luau, Vergs and I were ready to call it a day. But then we remembered that we still had tickets to watch the Ha: Breath of Life show. And so we did. And I’m really happy that we chose to stay. The Ha: Breath Of Life show basically takes you on a story that goes through the different Polynesian islands. I don’t want to spoil the show, but all I’ll say is I strongly recommend reading the synopsis in the playbill they provide, BEFORE the show starts. I did and it definitely made me appreciate the little details more, especially since I didn’t know much about the Polynesian Culture beforehand. The Polynesian Cultural Center was pretty much our first step of actually immersing ourselves in the island’s culture. I still can’t believe we get to call Hawaii our home for 3 years, you guys. It’s so surreal and we’re definitely going to make the most of it.